Why Are There So Many Names Of Sugar? Let's take a look. Why Are There So Many Names Of Sugar? If we want to really read and understand labels so we can avoid sugar, we need to know all the tricks of the trade and how sugar hides from us. Food manufacturers are getting savvy, knowing if sugar is high on their ingredient list, their product isn’t exactly going to fly off the shelf. So what do they do? Firstly they disguise sugar under all these different names knowing people don’t associate many of these with just plain old sugar. Secondly, they use multiple versions of sugar. Ingredients are listed in order of the quantity present in that product. If a product has more sugar than anything else, sugar will be the first ingredient on the list. Now food manufacturers know that if sugar is no.1 on the list, people probably won’t buy it. They want sugar to be as far down the list as possible so they use multiple types of sugar and suddenly each type of sugar is individually smaller and will now appear further down the ingredient list, giving you the impression sugar is no longer the number 1 ingredient. So watch out for all the names of sugar, and add them up. Look at the nutrition label for total sugar per serving as well as the ingredient list. And don’t be fooled by “no added sugars” (may still be high with naturally occurring sugars) or “refined sugar free” (generally means it’s packed with coconut sugar, dried fruit or some other sugar). Sugar is sugar no matter what you call it. What other names of sugar have you discovered? These aren’t all of them. 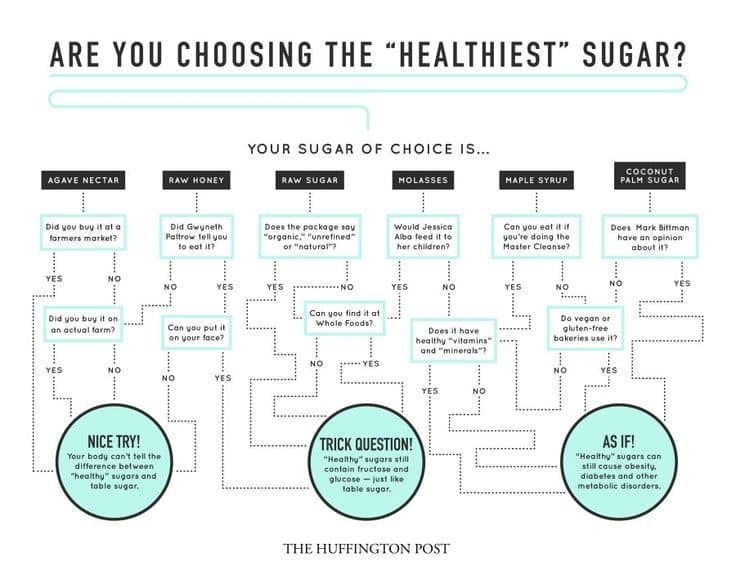 « How Much Sugar Is In A Healthy Diet? What about coconut nectar syrup? i thought sorghum was a flour? What is the best sweetener to use? I am a diabetic but can’t drink coffee without at least sweetener. Of all the sweeteners which is the best choice as far as a keto diet goes? I have used xylitol and it is the closest thing to sugar that I have used. Fabulous question. 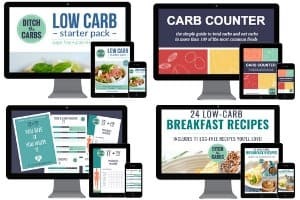 Take a look at my Ultimate Guide To Low-Carb Sweeteners – what I use and what I avoid. Please can I check – is Maltodextrin a bad choice? It’s in Canderel a sweetener in the UK. Thank you. I’m confused. If the label says 0% sugar you cant trust it? If any of these names are in the label, you can’t have ANY on keto? You just need to read labels carefully, especially as new low-carb products are coming onto the market. Some will say “refined sugar free” “organic sugars only” “uses only natural sugars” … but they will still have sugar, just not regular table sugar as most of us assume sugar is. Even some sugar free chocolate and low-carb bars have no sugar in them but mention maltitol separately, which is sneaky as it raises blood sugars. Maltodextrin is also a big one being used in everything lately. Maltitol is slightly better but still quite high on the GI. Okay that is interesting, an ingredient label I read yesterday to see if it was alright to eat had Corn Syrup, yet had nothing about sugar. Thank goodness I never ate it, the only reason why I didn’t was because that word “syrup” sounded sweet. I am using the – unsure – don’t eat lol. I am on my 12th day sugar free now, didn’t want to ruin it even by accident! Thos nutrition labels can be so confusing, well done you for not eating it. If you’re unsure don’t eat it is a great way to think “If in doubt, keep it out” is another one. Galactose? Wow. I thought that was a Fantastic Four nemesis. Who knew it was ours?